Holiday season is knocking at the door. There is no surprise that you are on the way to take your family to a new destination to explore. Well, why don't you try something out-of-the-box but yet within budget? Yes, you can surely opt for Tripura - one of the most vibrant Seven Sisters of India. Choose a suitable Tripura Tour Package and go ahead. Tripura is a tiny state in Northeast India known for its treasured archeology, rich handicrafts, melodious music and diverse culture. Surprisingly, this little state is the home to 19 indigenous tribes forming about 30% of the total population of Tripura. However, the Bengali Hindu inhabitants make the ethno-linguistic majority in this state. The state is blessed with greenery covering over half of the area. Cane and bamboo tracts are common in the forests in Tripura. With its stone images and state-of-the-art rock cut carvings at Debtamura, Unakoti and Pilak, it stands out among Seven Sisters. 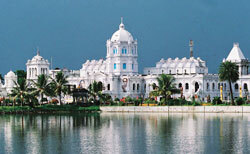 Being the capital of the state, Agartala is the second largest city of the Northeast India. Within its tiny geographical territory, Tripura has a lot for the travellers. DAY 1 ARRIVE GUWAHATI: On Day 1, arrival in Guwahati, meets to the Incredible India tour guidance/ representative who will assist and guide your check in to the hotel in Guwahati for overnight stay. DAY 2 GUWAHATI - AGARTALA: Tour will start from Guwahati by air and reach at Agartala. We drive towards the Geetanjali Tourism Guest House for stay overnight. DAY 3 AGARTALA - JAMPUI: On Day 3, leave Agartala for visit Jampui Hills at 8:00 AM. Upon arrival, you check in the Vangmun Eden Tourist Lodge in Jampui Hills near 2:00PM by road. Enjoy lunch, sightseeing and overnight stay at Jampui Hills. DAY 4 JAMPUI - UNAKOTI: On Day 4, we leave Eden Tourist Lodge near 8:00 AM and reach to the Unakoti Tourist Lodge. After lunch at the Unakoti Tourist Lodge, you visit Unakoti Heritage site. Overnight stay in Unakoti. DAY 5 UNAKOTI - NEERMAHAL: On Day 5, we leave Unakoti Tourist Lodge near 8:00AM and reach to the Sagarmahal Tourist Lodge, Melaghar at 2:00PM and enjoy Lunch. We visit Neermahal and overnight stay at Sagarmahal Tourist Lodge. DAY 6 NEERMAHAK - UDAIPUR (TRIPURA) - AGARTALA: On Day 6, we check out the Sagarmahal Tourist Lodge near 8:00AM and arrive to the Matabari, Udaipur near 9:30AM. Enjoy the attractions of the valley including Bhubeneswari Temple, Matabari and Tepania Eco Park. Enjoy lunch at Gomati Yatri Niwas. After lunch, we leave Udaipur near 2:00PM and reach at Agartala near 3:30PM. After rest, enjoy sightseeing in and around Agartala. Overnight stay in Agartala. DAY 7 AGARTALA - KOLKATA / DELHI / ONWARD DESTINATION: Day 7, we leave Geetanjali Tourism Guest House for Agartala airport to reach and board the flight for Kolkata/ Delhi. If you are going to visit Tripura, the best time to do so would be between the months of October and May. The rainy season that lasts from June to September, is best avoided because of heavy and incessant rains that make enjoying the trip very difficult. Tripura offers a lot to its visitors. Though you might not find something thrilling or adventurous to discover, there are definitely certain things that must be explored to enjoy a 3600 tour of the state. Lush green valley, dewy landscapes, hilly rocks are what you are probably looking for in a perfect gateway and Tripura is just perfect to fulfill your desires being a fantasy land for the nature lovers with its treasure of gigantic mountains and gorgeous waterfalls. In fact, the state has abundance of natural beauty in the form of palaces, water bodies, forest and wildlife. The local people are cordial and welcoming. Let's have a quick look at the places that must be included in your chosen Tripura Tourism Packages. Agartala - The capital of the state known for fresh produce of jute, rice, tea and oil seeds. The best destinations to visit in Agartala are Ujjayanta Palace, Neermahal and Kunjaban Palace. Kumarghat - Situated in North Tripura the place is famous for pineapple cultivation and other form of fruit farming. Venuban Vihar built by Magadha King Bimbisar is something you shouldn't miss while at Kumarghat. Deotamura - Located in the north-east part of the state, this place is known for its rock-cut sculptures on the bank of Gomati. Pilak - Situated at a distance of 100 km from Agarala, Pilak is nestled amidst dense valleys and paddy fields. The place features important archaeological remains. Unakoti - The place is known for ancient temples and rock cut sculptures. Jampui Hills - This highest range of hills gives a spectacular view of the amazing valleys. Udaipur - Situated at a distance of 55 km from Agartala, it is known for lavish temples including Bhubaneswari Temple and Tripura Sundri Temple. The place also features Sepahijala Wildlife Sanctuary. Receive: 4.9 ★★★★★ rating based on 68 reviews from our customers on Google & Facebook. Narurecamp Travels is best travel agency & tour operator for North Sikkim Tour Packages, North East India Tour and more..